The Bearded Dragon care guide has been written by Kirsten McEvoy. Kirsten is one of the shop volunteers and secretary of the Young Reptile Keepers Club. The central bearded dragon (pogona vitticeps), normally known as the bearded dragon, originates from Australia. There are 5 other species of bearded dragon, although only 2 of them, the central and the Rankins (pogona henrylawsoni) are available. In this article, we will only be talking about the central bearded dragon, as the care needs are slightly different. 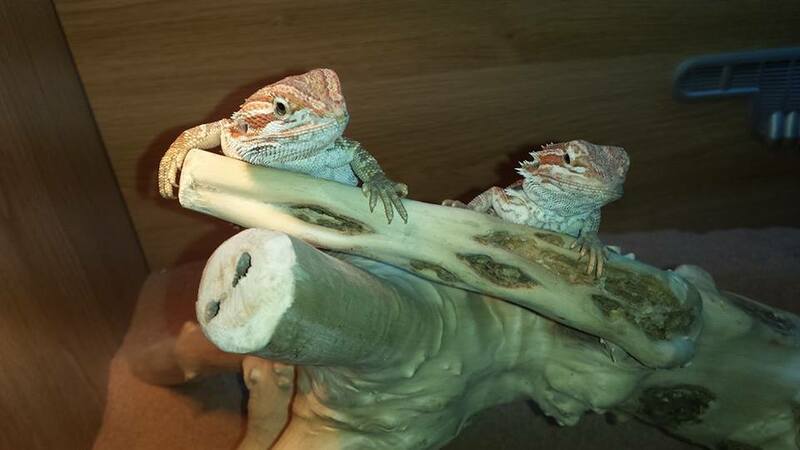 Bearded dragons, often referred to as ‘beardies’ are a very popular species to keep by keepers new and old. They have a lot of personality, are very easy to tame and come in a wide range of patterns and colours. Their biggest feature is the beard they have on their chin, which they can puff out and turn black, to chase away predators, display to other bearded dragons, or sometimes when they’re bored. Coming from Australia, bearded dragons like it hot, and while they spend most of their time on the ground, they will sometimes climb whatever they can, although they can’t stick to things like a lot of geckos can! They are generally happy to socialise, cuddle, and interact with people. Occasionally a bearded dragon will prefer to have a day to itself. As you get to know your dragon, you will be able to tell if he/she is feeling a little less sociable. As babies, bearded dragons are very small at about 4 inches long and around 25 grams, but they are big eaters and within a year can grow up to around 20 inches and 500 grams. Bearded dragon are oviparous, or ‘egg layers’. Once bred, a female bearded dragon can lay up to 6 batches of 16-36 eggs, so it’s important to keep males and females apart unless you can afford to feed up to 216 very hungry babies! As with all our species specific care guides, we have based the information that follows around the ‘Five Needs’ outlined in the Animal Welfare Act(2006). The Need for a Suitable Environment Enclosure: Your bearded dragon will require an appropriately sized enclosure that must be escape proof for both occupant and any live food offered and it must prevent ingress of other animals such as curious family cats. Bearded dragons are mostly terrestrial (ground-dwelling) animals, so ground space is really important. Their environment in the wild is hot and dry and these conditions need replicating in captivity. 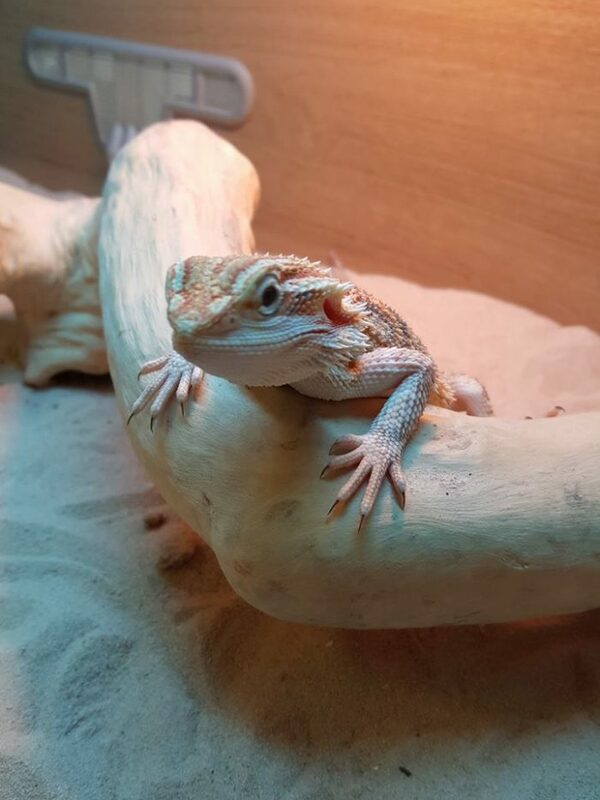 Enclosure size: Bearded dragons are often purchased as small hatchlings, and for a very young dragon a 3ft x 1.5ft x 1.5ft will be sufficient, however as they grow very quickly we recommend the full size 4ft x 2ft x 2ft that an adult requires. This means you won’t have to purchase a bigger enclosure later.A front-opening wooden vivarium is best for a dragon, as they don’t like anything coming in from above their heads. Lighting and heating: Coming from Australia, bearded dragons like it hot and bright. A basking bulb on a thermostat is required to bring a particular spot, the bearded dragon’s basking spot, to 40C (104F). When the temperature is correct, you will see your bearded dragon spread themselves out, close their eyes and open their mouth (gaping). This means your dragon is very happy and comfortable. Bearded dragons also need UVB light, as they come from a desert area. This is provided by a 10.0 or 12.0 tube that runs across two thirds of the enclosure, and it lets the bearded dragon process calcium, which is very important for strong bones. Both of the lights should be on for 12 hours a day in summer and 10 hours a day in winter. If your house drops below 22C at night, a ceramic bulb may be needed to keep your dragon warm enough at night without disturbing them, but if your house is warm overnight then it is not required. It is very important to have any heat producing items on a thermostat so they produce the right temperatures. Bulbs can get very hot so it’s important to keep an eye on your temperatures using an accurate digital thermometer. Substrate is the material used to line the bottom of the enclosure. For young dragons, kitchen roll is the best substrate as they are messy eaters and for a young dragon, swallowing loose substrate can be fatal. With an older, larger dragon, there are many options for substrate depending on the look you are going for. Kitchen roll is still appropriate, but sand or a dirt/sand mix is good if you are looking for a more natural look. Dirt/sand also allows the dragon to perform natural behaviours like digging. Slate can also be used if you want easy cleaning but don’t like the look of kitchen roll. Enclosure Furnishing: Bearded dragons don’t require a lot of furniture in their enclosure. 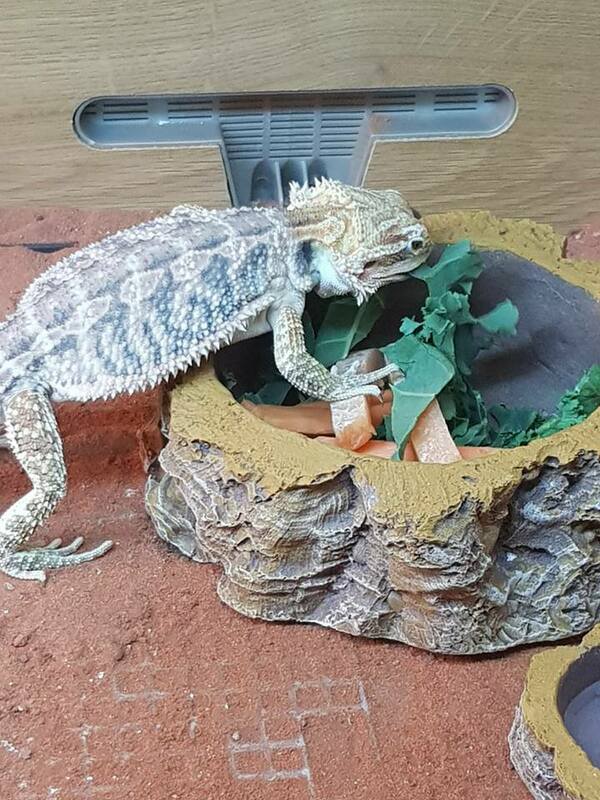 A pot for salad should be provided, and a small dish of calcium should be left in the enclosure at all times so the dragon can take what it needs. A small water dish should also be provided in the cool end of the enclosure. Bearded dragons usually do not drink from still water, but if you put your fingers in the water and move it when they are watching, they will normally get the idea. Some kind of basking platform should be provided so that the dragon can get closer to the bulb if they want to – but no closer than 6 inches to avoid burns. This can be cork, branches, slate, bricks, a hammock or something else dragon safe. There is no limit except your imagination. Vivarium Decor: Other than the basking platform, you can provide other branches, cork and hides so that your dragon has a lot to do and lots of places to hide if necessary. Plants can be used, but a bearded dragon will try to eat these, so they should be checked to see if they are bearded dragon safe first. Enclosure Maintenance: Kitchen roll and slate should be spot cleaned or changed daily. If sand or a dirt/sand mix is used, daily removal of poo or uneaten food will suffice. Glass can be cleaned with a reptile safe disinfectant such as F10. Plastic and silk plants can be cleaned on a regular basis using reptile safe disinfectant or ‘Milton Solution’. They should be thoroughly rinsed after disinfection. A ‘Bio Active’ setup will have a completely different maintenance regime. It is claimed by some that a ‘Bio Active’ substrate can virtually render enclosure maintenance free. Sadly it doesn’t work quite like that. However a ‘Bio Active’ setup once fully established can reduce some aspects of enclosure maintenance. (It involves the use of custodians who live in the tank and help to keep it clean and fresh.) Please don’t forget, following enclosure maintenance it is good practice to wash or disinfect your hands. Suitable Diet: Bearded dragons are onnivores. They eat a combination of live food and vegetables. It is important to get the right mix of food for your dragon as they have different needs throughout their lives. As a baby, salad such as curly kale, spring greens, butternut squash, carrots and cabbage should be offered daily (never offer lettuce or spinach, as these are harmful to dragons). As well as the salad, babies require feeding appropriately sized live food such as crickets or locusts daily – depending on their stage of development they can eat up to a whole box of live food a day. These should be gut loaded and lightly dusted with a combined vitamin and mineral supplement. We highly recommend Repashy Calcium plus for dusting of all ‘live food’. Please see our ‘Live Food Guide’ for details of how to gut load your ‘bug’. As they get towards a year old and their full size, salad should still be offered daily, but the live food can be slowly reduced to every other day, and eventually twice a week. Some people report that their dragons don’t eat their salad or are very picky with their live food. This is normal – bearded dragons are sometimes like small children when it comes to food, and you just have to keep trying and they will eventually eat what you are offering. Occasionally, fruit may be given, such as grapes, melon, strawberries or raspberries. Bearded dragons love these but they should be given sparely as it can give them the runs. Bearded dragons don’t require a lot of water and once taught to drink out of their water dish are usually fine. If a bearded dragon is looking dehydrated, a short warm bath will normally see them drink. The Need to Express Normal Behaviour: By providing a suitable environment we create conditions where our dragon can display normal behaviour patterns. For instance, the provision of the gentle thermal gradient allows your ‘beardie’ to display normal ectothermic behaviour. The Need to be Housed with or Apart From Other Animals: While many keepers keep baby bearded dragons together, this is not something we condone. Bearded dragons are not social with their own kind, and keeping dragons together even when young can result in nipped tails, bitten off toes, greater injury and even death. Sexing of a bearded dragon can be done relatively easily once a dragon reaches about 3 or 4 months. Any sooner and it is too early to tell. Place your bearded dragon on your hand with its tail facing towards you and lift the tail up. If there are two bumps there, you have a male, if not you have a female. If you house a male and female together you will inevitably get breeding activity. Males reach sexual maturity earlier than females. They will often harass a female for mating before she is ready. Premature breeding can place a heavy toll on the female. If you do house male and female together you must be prepared for the consequences of breeding. Please see our ‘Basic Guide to Breeding Reptiles’ to gain greater understanding of the factors that MUST be taken into consideration should you breed from your reptiles. Suitable Diet: Bearded dragons are onnivores. They eat a combination of live food and vegetables. It is important to get the right mix of food for your dragon as they have different needs throughout their lives. As a baby, salad such as curly kale, spring greens, butternut squash, carrots and cabbage should be offered daily (never offer lettuce or spinach, as these are harmful to dragons). As well as the salad, babies require feeding appropriately sized live food such as crickets or locusts daily – depending on their stage of development they can eat up to a whole box of live food a day. These should be gut loaded and lightly dusted with a combined vitamin and mineral supplement. We highly recommend Repashy Calcium plus for dusting of all ‘live food’. Please see our ‘Live Food Guide’ for details of how to gut load your ‘bug’. As they get towards a year old and their full size, salad should still be offered daily, but the live food can be slowly reduced to every other day, and eventually twice a week. Some people report that their dragons don’t eat their salad or are very picky with their live food. This is normal – bearded dragons are sometimes like small children when it comes to food, and you just have to keep trying and they will eventually eat what you are offering. Occasionally, fruit may be given, such as grapes, melon, strawberries or raspberries. Bearded dragons love these but they should be given sparely as it can give them the runs. Bearded dragons don’t require a lot of water and once taught to drink out of their water dish are usually fine. If a bearded dragon is looking dehydrated, a short warm bath will normally see them drink. The Need to Express Normal Behaviour: By providing a suitable environment we create conditions where our dragon can display normal behaviour patterns. For instance, the provision of the gentle thermal gradient allows your ‘beardie’ to display normal ectothermic behaviour. The Need to be Housed with or Apart From Other Animals: While many keepers keep baby bearded dragons together, this is not something we condone. Bearded dragons are not social with their own kind, and keeping dragons together even when young can result in nipped tails, bitten off toes, greater injury and even death. Sexing of a bearded dragon can be done relatively easily once a dragon reaches about 3 or 4 months. Any sooner and it is too early to tell. Place your bearded dragon on your hand with its tail facing towards you and lift the tail up. If there are two bumps there, you have a male, if not you have a female. If you house a male and female together you will inevitably get breeding activity. Males reach sexual maturity earlier than females. They will often harass a female for mating before she is ready. Premature breeding can place a heavy toll on the female. If you do house male and female together you must be prepared for the consequences of breeding. 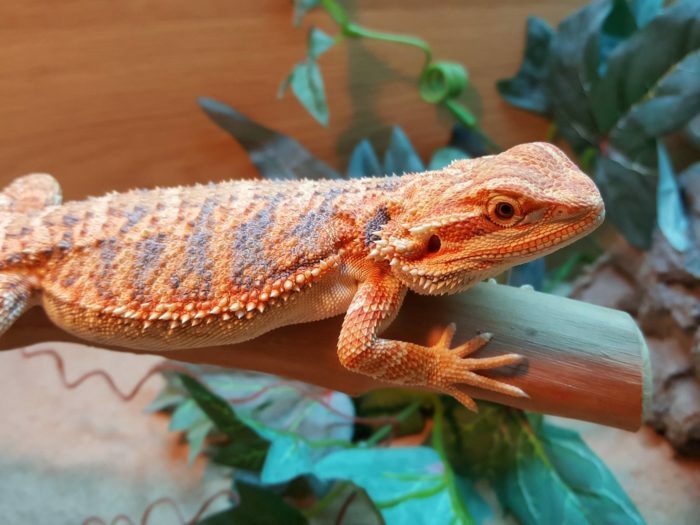 Please see our ‘Basic Guide to Breeding Reptiles’ to gain greater understanding of the factors that MUST be taken into consideration should you breed from your reptiles.